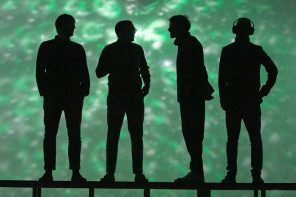 Frieze art fair, which is on its ninth show this October 2011, is a must for any art lover as it brings together, under one roof, an extraordinary mix of contemporary pieces from the best global galleries. As Grayson Perry said this week at the opening breakfast of his exhibition The Tomb of the Unknown Craftsman at the British Museum, ‘Frieze is like the village fete of the art world’ . And it’s not just about the Regent’s Park fair, all over London there are art events and exhibition openings related to Frieze, I’ve been to the opening of Pipilotti Fist and Gerhard Richter this week, both fantastic and Middleagedad went to Grayson’s event (also wonderful, but you already know we are big fans of Grayson) and Jane’s already mentioned some of the stores that are getting involved. 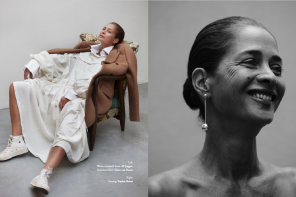 But fantastic tho the art is, it was touch and go as to what I put up first…the art or the clothes (art lovers are great dressers)…..art won, so come back next week for the clothes (which are fab enough to fill three posts!). Meanwhile here are my highlights. For a more extensive review of the fair, can I suggest you visit middleagedad’s blog here, he’s much better at it than me. 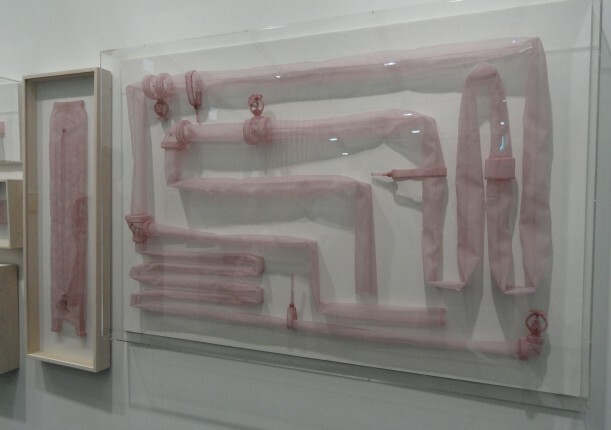 My favourite artist was Do Ho Suh (first picture), a Korean artist, whose Specimen series New York City Corridor – 1, was a selection of items he found in a New York corridor all made to scale out of pink polyester chiffon, incredibly delicate and ghostly and yours for £225,000. 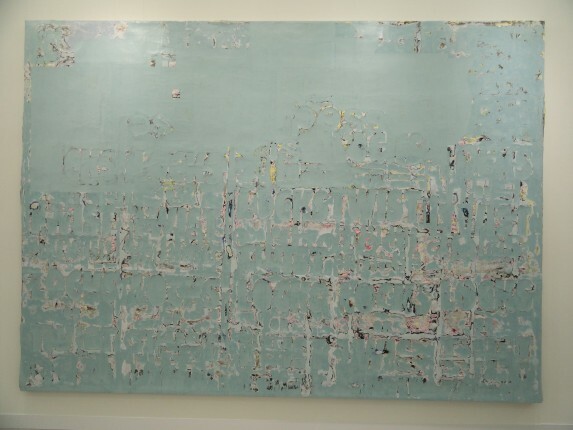 I also loved Mark Bradford’s – Untitled, (above) where the palest blue surface scraped away in a vague grid structure to reveal colourful sub layers. 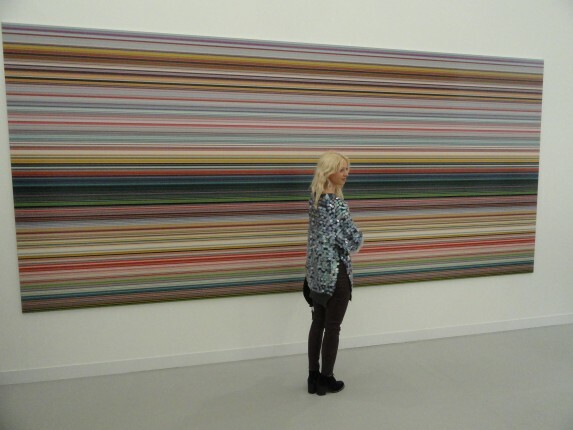 Below is a Gerhard Richter, finished only two weeks ago and bought (it is rumoured) for £1.5 million. We’ll have two then! 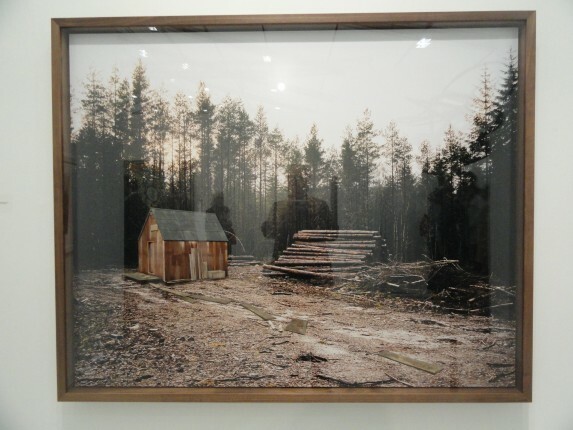 This gorgeous photograph (below) by Alex Hartley – Waiting for the daylight to end ( Kaczynski’s cabin), looks flat, but when you get up close the hut is in fact a layer of finely crafted wood applied on top of the print. Abstract. 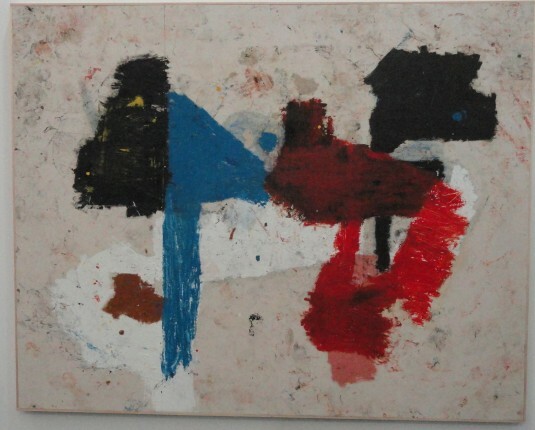 colourful shapes from Joe Bradley – Horse thief 2011 (below) I thought of Danish murder mysteries when I saw this. 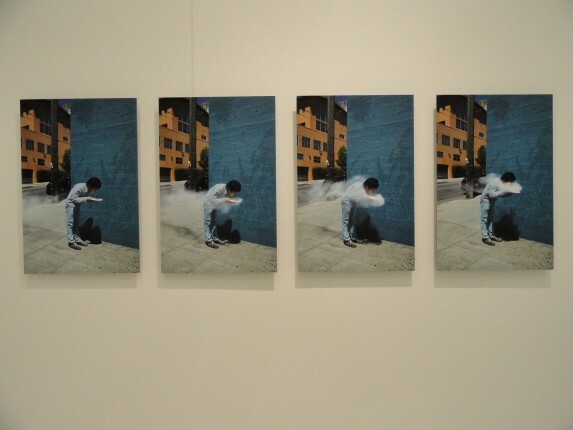 Perhaps my favourite set of photos, (below) by Japanese artist Koki Tanaka, since it is Japanese, the sequence is read from right to left. 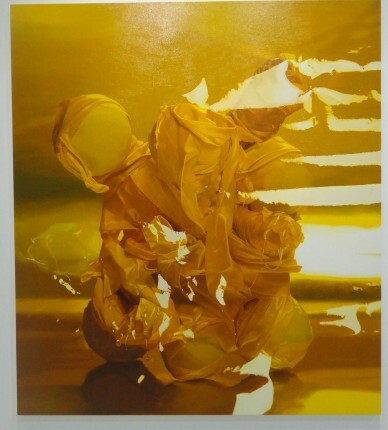 This is not a photograph (below) but in fact a finely detailed oil painting by Neil Gall – Divisibility ( Indefinite) 2011 , gloriously glowing colour, wouldn’t it cheer up a wall? 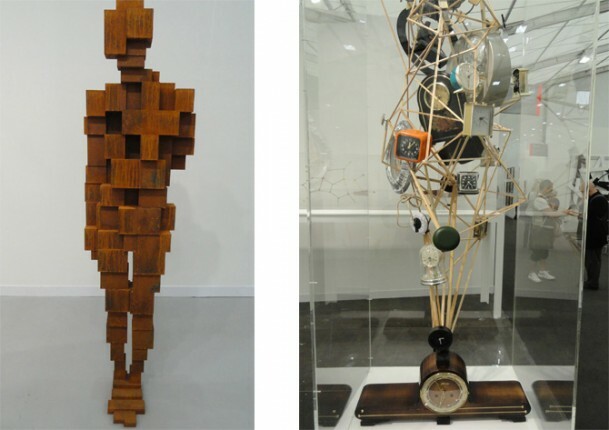 My favourite sculpture was the Anthony Gormley (below left), it had a real elegance. I wanted to take home the fabulous clocks sculpture by Bjorn Dahlem – M-Zeit 2011 – Wood, steel, clocks, ink, but sadly we’ve not got 28,000 euros spare. Things you could do at home…..
Now, I mean no disrespect here, but sometimes you look at some of this conceptual art and think ‘I could do that’ . 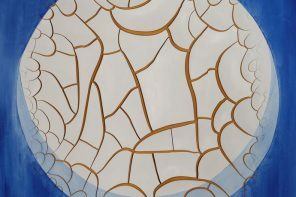 I am not a big art thinker, I like my art to look lovely and don’t want to work too hard to understand it. 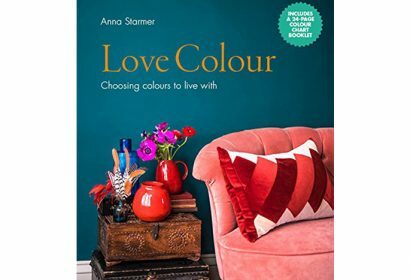 Also, most things at Frieze are darned expensive, so if you are strapped for cash and like making things yourself, here’s a couple of ideas I thought might be easy to get’ inspired*’ by. 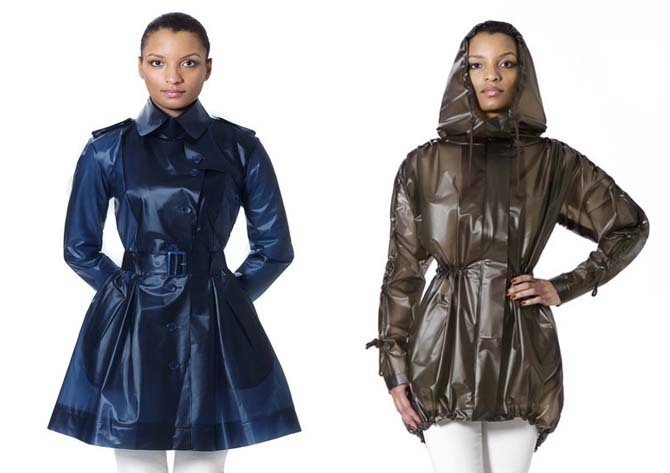 * Inspired, in the fashion world, this word is used when we mean ‘copy exactly but with enough changes so we wont get sued’. 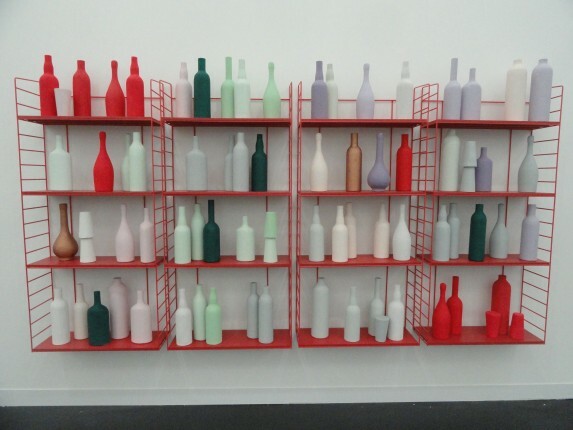 Jane has done something similar to this shelves and bottles idea at her house, with her lovely and extensive display of vases. I actually really like this work Gentleman’s Relish, by Matthew Brannon(above) but I would worry people would think the bottles were wine bottle in our house and wreck the thing. 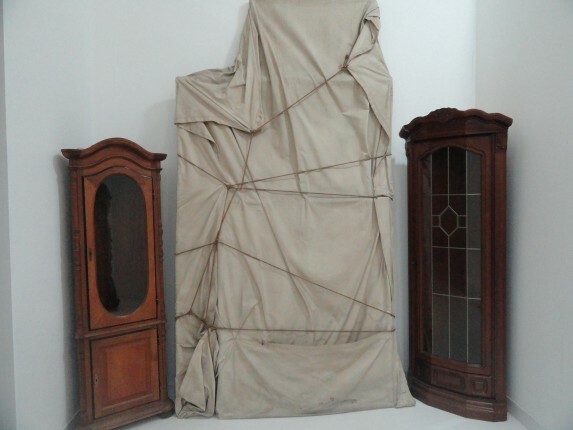 This is of course by Christo,-Wrapped Painting 1968- I didn’t ask the price but we know it’s going to be stratospheric….Not so hard to replicate though? Now, where’s that old dust sheet…. Next articleOne more doggie treat: get your tissues out!